Copyright © 2010 Control Station, Inc. All Rights Reserved. Control Station, the Control Station logo, csTuner Powered by Control Station, the csTuner logo, and the NSS Modeling Innovation are either registered trademarks or trademarks of Control Station Incorporated in the United States and/or other countries. All other trademarks are the property of their respective owners. Tuning PID controllers can seem a mystery. Parameters that provide effective control over a process one day fail to do so the next. The stability and responsiveness of a process seem to be at complete odds with each other. And controller equations include subtle differences that can baffle even the most experienced practitioners. Even so, the PID controller is the most widely used technology in industry for the control of business-critical production processes and it is seemingly here to stay. This guide offers a "best-practices" approach to PID controller tuning. What is meant by a "best-practices" approach? Basically, this guide shares a simplified and repeatable procedure for analyzing the dynamics of a process and for determining appropriate model and tuning parameters. The techniques covered are used by leading companies across the process industries and they enable those companies to consistently maintain effective and safe production environments. 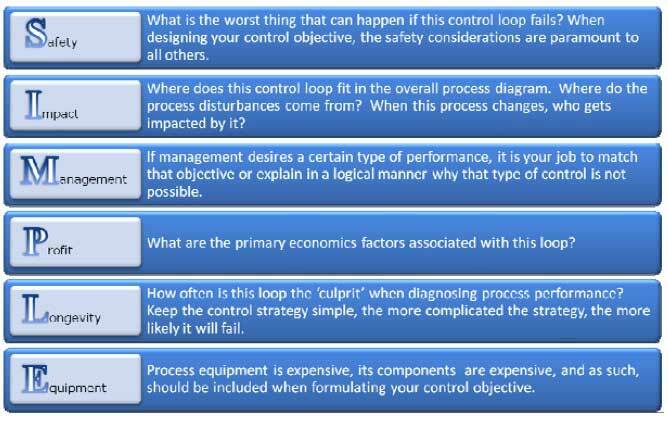 What's more, they're techniques that are based on Control Station's Practical Process Control – a comprehensive curriculum that has been used to train over a generation of process control professionals. Our guide provides the fundamentals – a good starting point for improving the performance of PID controllers. It offers an introduction to both the art and the science behind process control and PID controller tuning. Included are basic terminology, steps for analyzing process dynamics, methods for determining model parameters, and other valuable insights. With these fundamentals we encourage you to investigate further and fully understand how to achieve safe and profitable operations. As I shared, the PID controller appears here to stay. Through use of the Proportional-Integral-Derivative (PID) controller, automated control systems enable complex production process to be operated in a safe and profitable manner. They achieve this by continually measuring process operating parameters such as Temperature, Pressure, Level, Flow, and Concentration, and then by making decisions to open or close a valve, slow down or speed up a pump, or increase or decrease heat so that selected process measurements are maintained at the desired values. The overriding motivation for modern control systems is safety. Safety encompasses the safety of people, the safety of the environment, as well as the safety of production equipment. The safety of plant personal and people in the surrounding community should always be the highest priority in any plant operation. Good control is subjective. One engineer's concept of good control can be the epitome of poor control to another. In some facilities the ability to maintain operation of any loop in automatic mode for a period of 20 minutes or more is considered good control. Although subjective, we view good control as an individual control loop's ability to achieve and maintain the desired control objective. But this view introduces an important question: What is the "control objective"? It can be argued that knowing the control objective is the single most important piece of information in designing and implementing an effective control strategy. Understanding the control objective suggests that the engineering team has a firm grasp of what the process is designed to accomplish. This must be the case whether the goal is to fill bottles to a precise level, maintain the design temperature of a highly exothermic reaction without blowing up, or some other objective. Truly the control objective involves this and more. Shown on the right is a typical surge tank. Surge tanks are used to minimize disturbances to other downstream production processes. They are usually tuned conservatively, allowing the process variable to drift above and below set point without exceeding the upper or lower alarms limits. 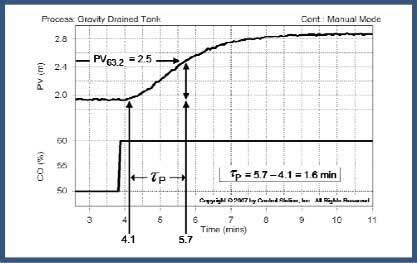 In most cases, tight control over a surge tank is counterproductive as tight control does not adequately insulate other production processes from disturbances. Shown on the left is a steam drum. 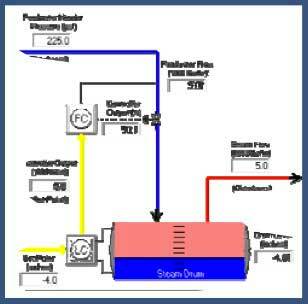 Steam drums act as a reservoir of water and/or steam for boiler systems. They are typically engineered with very tight tolerances around set point in order to maintain a specific level of steam production. Variation of the level is detrimental to the process' efficiency and productivity. The best way to learn about the dynamic behavior of a process is to perform tests. Even though open loop (i.e. manual mode) tests provide the best data, tests also can be performed successfully in closed loop (i.e. automatic mode). 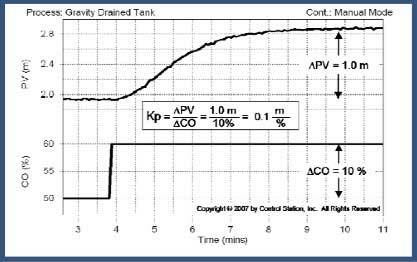 The goal of a test is to move the controller output (CO) both far enough and fast enough so that the dynamic character of the process is revealed through the response of the measured process variable (PV). As shared previously, the dynamic behavior of a process usually differs from operating range to operating range, so be sure to test when the process variable is near the value for normal operation of the process. Production processes are inherently noisy. As a result, process noise is typically visible in the data, showing itself as random chatter. It must be considered prior to conducting a test. If the test performed is not sufficient in magnitude, then it is quite possible that process noise will mask the dynamics – completely or partially – and prevent effective tuning. To generate a reliable process model and effective tuning parameters, it is recommended that only tests that are 5-10 times the size of the noise band be performed. Disturbances represent another important detail that must be considered when performing tests. A good test establishes a clear correlation between the planned change in controller output with the observed change in measured process variable. If process disturbances occur during testing, then they may influence the observed change in the measured process variable. The resulting test data would be suspect and, as a result, additional testing should be performed. There are a variety of tests that are commonly performed in industry. They include the Step, Pulse, Doublet, and Pseudo Random Binary Sequence. Examples of each are shown on the following page. Step Test – A step test is when the controller output is "stepped" from one constant value to another. It results in the measured process variable moving from one steady state to a new steady state. Unfortunately, the step test is simply too limiting to be useful in many practical applications. The drawback is that it takes the process away from the desired operating level for a relatively long period of time which typically results in significant off-spec product that may require reprocessing or even disposal. Pulse Test – A pulse test can be thought of as two step tests performed in rapid succession. The controller output is stepped up and, as soon as the measured process variable shows a clear response, the controller output is then returned to its original value. Ordinarily, the process does not reach steady state before the return step is made. Pulse tests have the desirable feature of starting from and returning to an initial steady state. Unfortunately, they only generate data on one side of the process' range of operation. Doublet Test – A doublet test is two pulse tests performed in rapid succession and in opposite directions. 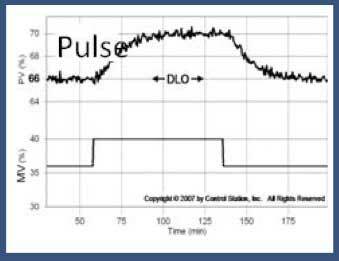 The second pulse is implemented as soon as the process has shown a clear response to the first pulse. 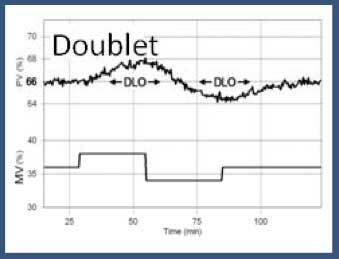 Among other benefits, the doublet test produces data both above and below the design level of operation. For this reason, many industrial practitioners find the doublet to be the preferred test method. 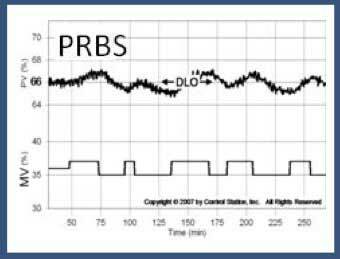 PRBS Test – A pseudo-random binary sequence (PRBS) test is characterized by a sequence of controller output pulses that are uniform in amplitude, alternating in direction, and of random duration. It is termed "pseudo" as true random behavior is a theoretical concept that is unattainable by computer algorithms. The PRBS test permits generation of useful dynamic process data while causing the smallest maximum deviation in the measured process variable from the initial steady state. Was the process at a relative "steady state" before the test was initiated? Beginning at steady state simplifies the process of determining accurate model an d tuning parameters. It allows for a clear relationship between the change in controller output and the associated response from the manipulated process variable to be demonstrated. Said another way, it eliminates concern that test results may have been compromised by other non-test-related dynamics within the process. This is true when calculating model and tuning parameters by hand as well as when using most tuning software tools. Did the dynamics of the test clearly dominate any apparent noise in the process? It is important that the change in either controller output or set point cause a response that clearly dominates any process noise. To meet this requirement, the change in controller output should force the process variable to move at least 5-10 times the noise band. By doing so, test results will be easier to analyze. Were disturbances absent during testing? It is essential that test data contain process dynamics that were clearly – and in the ideal world exclusively – forced by changes in the controller output. Dynamics resulting from other disturbances – known or unknown – will undermine the accuracy of the subsequent analysis. If you suspect that a disturbance corrupted the test, it is conservative to rerun the test. Traditional "state-of-the-art" process modeling and tuning tools require steady-state operation before conducting tests. Failure to achieve or maintain steady-state operation during these tests impairs the efficacy of the model parameters produced by such tools. Depending on the process involved, the impact of sub-optimal model parameters can be significant in terms of associated increases in production cost , reduction of production throughput, compromising of production quality, and overall undermining of production safety. 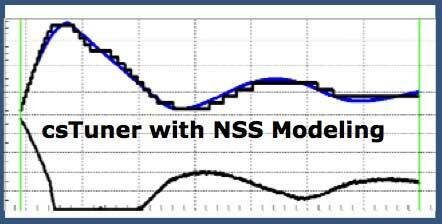 Control Station's NSS Model Fitting Innovation applies a unique method for modeling dynamic process data and does not require steady-state operation prior to performing tests. As a result, the innovation offers significant advantage over other modeling and tuning technologies. The NSS Model Fitting Innovation does not utilize a specific data point or average data point as a "known" and is therefore not constrained by it. Rather, the NSS Model Fitting Innovation centers the model across the entire range of data under consideration. Since no data point is weighted disproportionately in the calculation and minimization of Error, the innovation is free to consider all possible model adjustments and to optimize the model's fit relative to all of the data under analysis. Shown on the left is a trend depicting the model fit produced by traditional PID tuning software. The process is in the midst of a transition, preventing the software from accurately describing the process' dynamic behavior. Shown on the right is a trend of the same process data and the corresponding model generated with csTuner. Even though in the midst of a transition, csTuner accurately models the dynamic behavior and produces effective tuning parameters. When using software to model a process and tune the associated PID controller, be aware that the data collection speed is as important as any other aspect of the test. As shared previously, a good test should be plain as day – it should start at steady state and show a response that is distinct from any noise that may exist in the process. But if data is not collected at a fast enough rate, the software will be unable to provide an accurate model and in all likelihood the effort to tune the controller will fail. They say a broken watch is right twice a day. Now imagine a highly oscillatory process that swings 15% above and below set point every minute. That same process would be at the desired set point twice each minute – every 30 seconds or so. If data for this process is captured every 30 seconds, it is possible that th e data would show a flat line and suggest that the process is under perfect control. That data collection rate is clearly not fast enough to provide adequate resolution. Shown below are a pair of real-world examples where the data collection rates were too slow and the information insufficient for tuning. The first example shows a trend depicting a series of changes to valve position and their associated impact. The data was taken directly from the plant's data historian. As the arrows point out, the data suggests that the process variable started to change before the valve's position was adjusted. That is either a sign of a very smart and psychic process or one where the data doesn't adequately tell the story. The second example involves a flow loop where data was collected at a rate of 30 seconds. When trying to assess the dynamic behavior of a process, it is important to have access to data that is collected fast enough so that the shape of the response is visible. In this case, data from the plant's historian only shows the starting and ending points associated with the increases to cont roller output. Absent is any truly useful information related to the process' dynamic behavior. Success in controller tuning largely depends on successfully deriving a good model from bump test data. The First Order Plus Dead-Time (FOPDT) model is the principal model – or tool – used in tuning PID controllers. That requires an explanation given that the FOPDT model is too simple for time varying and non-linear process behavior. Though only an approximation – for some processes a very rough approximation – the value of the FOPDT model is that it captures the essential features of dynamic process behavior that are fundamental to control. When forced by a change in the controller output, a FOPDT model reasonably describes how the measured process variable will respond. Specifically, the FOPDT model determines the direction, how far, how fast, and with how much delay the measured process variable should respond with relative accuracy. The FOPDT model is called "first order" because it only has one (1) time derivative. The dynamics of real processes are more accurately described by models that possess second, third or higher order time derivatives. Even so, use of a FOPDT model to describe dynamic process behavior is usually reasonable and appropriate for controller tuning procedures. Practice has also sh own that the FOPDT model is sufficient for use as the model in more advanced control strategies such as Feed Forward, Smith Predictor, and multivariable decoupling control. The FOPDT model is comprised of three (3) parameters: Process Gain, Process Time Constant, and Process Dead- Time. The remaining portion of this guide will focus on steps that can be followed to determine values for each of these parameters. Once determined, the guide will introduce tuning correlations with which tuning parameters can be derived and used by the associated PID controller. Is Your Process Non-Integrating or Integrating? The plots below show idealized trends from two processes as they respond to a step test. The process on the left is non-integrating, also called self-regulating. The process on the right is integrating, also called non-self-regulating. Understanding the difference prior to modeling the process data is critical as applying the wrong model can have a significant effect on the tuning parameters that are calculated. More importantly, choosing the wrong model can have a negative effect on your ability to control the process safely. A characteristic behavior of a non-integrating process is that it will naturally "self-regulate" itself – it will transition to a new steady state over ti me. As shown in the trend, the process responds to the change in controller output and tapers off to a new steady state of operation. In contrast, an integrating process does not have a natural balance point. As shown in the trend, the process moves steadily in one direction after the change in controller output occurs. The steady change associated with a integrating or non-self-regulating process will not stop until corrective action is taken. 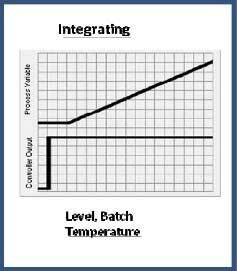 Process Gain is a model parameter that describes how much the measured process variable changes in response to changes in the controller output. A step test starts and ends at steady state, allowing the value of the Process Gain to be determined directly from the plot axes. 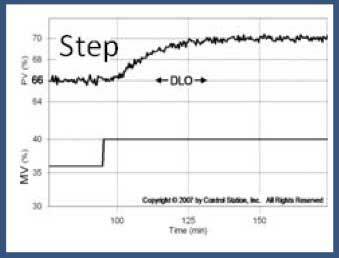 When viewing a graphic of the step test, the Process Gain can be computed as the steady state change in the measured process variable divided by th e change in the controller output signal that forced the change. The formula for calculating Process Gain is relatively simple. It is the change of the measured process variable from one steady state to another divided by the change in the controller output from one steady state to another. The strip chart offers a graphic by which the Process Gain can be determined. The graphic shows a 10% change in the controller output – the output increases from 50% to 60%. The measured process variable reacts to that change by moving from a steady stat e value of ~2.0 meters to a new steady state value of ~3.0 meters. The graphic shows how the Process Gain from this example should be calculated. The change in the measured process variable is equal to 1.0 meter (i.e. ~3.0 meters - ~2.0 meters = 1.0 meter). The change in controller output is equal to 10% (i.e. 60% - 50% = 10%). Process Gain can then be computed as 0.1 meters/percent. This Process Gain can be interpreted to mean that for every 1% that the controller output increases, the process variable will increase by 1% of its total span. This value in percent span units should be between 0.5 and 2.5 for a well designed process. Controller Gains above the 2.5 upper limit are typically the result of a control valve or pump being oversized for its particular application. Values for the controller gain below the 0.5 lower limit are usually from an over-spanned sensor. 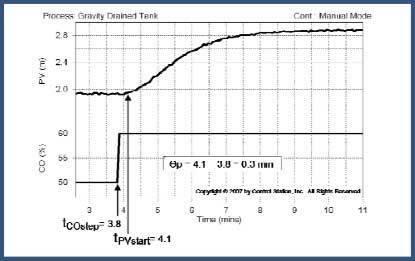 The overall Process Time Constant describes how fast a measured process variable responds when forced by a change in the controller output. Note that the clock that measures speed does not start until the measured process variable shows a clear and visible response to the controller output step. This is to distinguish the actual start for calculation purposes from the time when the controller output is first adjusted. The Process Time Constant is equal to the time it takes for the process to change 63.2% of the total change in the measured process variable. The smaller the time constant, the faster the process. As shown in the strip charts below, begin by identifying the time at which the measured process variable first reacts to the change in controller output – not the time when the controller output firs t changes. In the example shown, the measured process variable shows a distinct change beginning at approximately 4.1 minutes. By estimating the total change in the measured process variable, it is then possible to determine a value equal to 63.2% of the total change. In this case, the measured process variable moved from a value of ~1.85 meters to a value of ~2.85 meters. Therefore, 63.2% of the total change is ~0.6 meters (i.e. 2.85 meters – 1.85 meters = 1.0 meters x 0.632 = 0.6 meters ). By adding 0.6 meters to the initial value of the measured process variable (i.e. 1.85), it is apparent that th e measured process variable reaches the value of 2.45 meters at approximately 5.5 minutes. 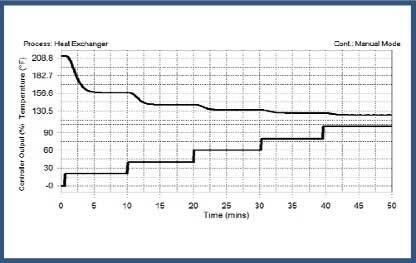 The Process Time Constant is the difference between the initial start of the change in the measured process variable and 63.2% of the total change in the measured process variable. In this example, the initial value is 4.1 minutes and 63.2% of the change occurs at 5.5 minutes. The Process Time Constant is equal to 1.4 minutes. Process Dead-Time is the ti me that passes from the moment the step change in the controller output is made until the moment when the measured process variable shows a clear initial response to that change. Process Dead-Time arises because of transportation lag and/or sample or instrumentation lag. Transportation lag is defined as the time it takes for material to travel from one point to another. Similarly, sample or instrument lag is defined as the time it takes to collect, analyze or process a measured variable sample. The larger the Process Dead-Time relative to the Process Time Constant, the more difficult the associated process will be to control. Typically speaking, as the Process Dead-Time exceeds the Time Constant, the speed by which the controller can react to any given change in that same process is significantly decreased. That undermines the PID controller's ability to maintain stability. It is for this reason that Process Dead-Time is often referred to as the "killer of control". Calculating Process Dead-Time is relatively straight forward. Begin by identifying the time at which the controller output is changed. In the example provided, the controller output is seen to change at a time of 3.8 minutes. Next, identify the time at which the measured process variable first reacts to the change in controller output. When calculating the Process Time Constant it was learned that the measured process variable shows a distinct change beginning at approximately 4.1 minutes. The Process Dead-Time is then calculated as 0.3 minutes (i.e. 4.1 minutes - 3.8 minutes). In essence, the dynamic behavior of production processes can be characterized by how one variable responds over time to another variable. 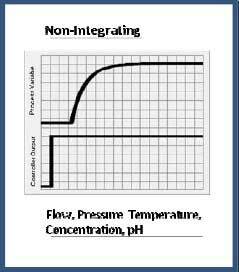 Understanding those dynamics allows the PID controller to maintain effective and safe control even in the face of disturbances. But gaining that understanding is not a trivial matter. Linear processes demonstrate the most basic dynamic behavior. They respond to disturbances in the same fashion regardless of the operating range. However, such processes are only linear for a period of time. All processes have surfaces that foul or corrode, mechanical elements like seals or bearings that wear, feedstock quality or catalyst activity that drifts, environmental conditions such as heat and humidity that change, and other phenomena that impact dynamic behavior. The result is that linear processes behave a little differently with each passing day. Nonlinear processes demonstrate dynamic behavior that changes as the operating range changes. Most production processes are nonlinear to one extent or another. With this understanding, nonlinear processes should therefore be tuned for use within a specific and typical operating range. PID controllers are by far the most widely used family of intermediate value controllers in the process industries. As such, a fundamental understanding of the three (3) terms – Proportional, Integral, and Derivative – that interact and regulate control is worthwhile. Proportional Term – The proportional term considers "how far" the measured process variable has moved away from the desired set point. At a fixed interval of time, the proportional term either adds or subtracts a calculated value that represents error - the difference between the process' current position and the desired set point. As that error value grows or shrinks, the amount added to or subtracted from the error similarly grows or shrinks both immediately and proportionately. Integral Term – The integral term addresses "how long" the measured process variable has been away from the desired set point. The integral term integrates or continually sums up error over time. As a result, even a small error amount of persistent error calculated in the process will aggregate to a considerable amount over time. Derivative Term – The derivative term considers "how fast" the error value changes at an instant in time. The derivative computation yields a rate of change or slope of the error curve. An error that is changing rapidly yields a large derivative regardless of whether a dynamic event has just begun or if it has been underway for some time. As a rule of thumb, no two processes behave the same. They may produce the same product, utilize identical instrumentation, and operate for the same period of time. However, like identical children they will inevitably develop unique characteristics. Even so, production processes do possess common attributes, and common approaches to controlling them can be applied with great success. P-Only — P-Only control involves the exclusive use of the Proportional Term. It is the simplest form of control which makes it the easiest to tune. It also provides the most robust (i.e. stable) control. It provides an initial and rapid kick in response to both disturbances and set point changes, but it is subject to offset. P-Only control is suitable in highly dynamic applications such as level control and in the inner loop of the cascade architecture. PI Control — PI is the most common configuration of the PID controller in industry. It supplies the rapid initial response of a P-Only controller, and it addresses offset that results from P-Only control. The use of two (2) parameters makes this configuration relatively easy to tune. PID Control — This configuration uses the full set of terms, including the Derivative, and it allows for more aggressive Proportional and Integral terms without introducing overshoot. It is good for use in steady processes and/or processes that either respond slowly or have little-to-no noise. The downfall of PID Control is its added complexity and the increased chatter on the controller output signal. Increased chatter typically results in excessive wear on process instrumentation and increases maintenance costs. The image below identifies each of the PID controller configurations and suggests a configuration(s) for various process types. Most industrial processes are effectively controlled using just two of the PID controller's terms – Proportional and Integral. Although a detailed explanation is worthwhile, for purposes of this guide it is hopefully sufficient to note that the Derivative term reacts poorly in the face of noise. The Derivative term may provide incremental smoothness to a controller's responsiveness, but it does so at the expense of the final control element. Since most production processes are inherently noisy, the Derivative term is frequently not used. PI controllers present challenges too. One such challenge of the PI controller is that there are two tuning parameters that can be adjusted. These parameters interact – even fight – with each other. The graphic on the right shows how a typical set point response might vary as the two tuning parameters change. 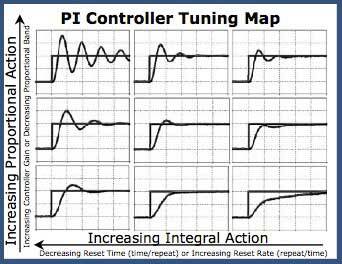 The tuning map below shows how differences in Gain and Reset Time can affect a PI controller's responsiveness. The center of the map is labeled as the base case. As the terms are adjusted – either doubled or halved – the process can be seen to respond quite differently from one example to the next. The plot in the upper left of the grid shows that when gain is doubled and reset time is halved, the controller produces large, slowly damping oscillations. Conversely, the plot in the lower right of the grid shows that when controller gain is halved and reset time is doubled, the response becomes sluggish. 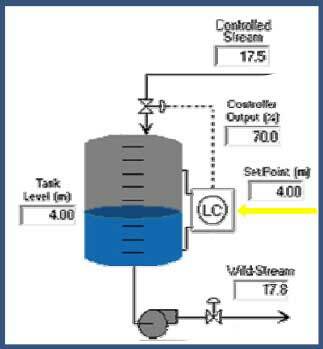 Control Station recommends use of the Internal Model Control (IMC) tuning correlations for PID controllers. These are an extension of the popular lambda tuning correlations and include the added sophistication of directly accounting for dead-time in the tuning computations. The IMC method allows practitioners to adjust a single value – the closed loop time constant – and customize control for th e associated application requirements. Final tuning is verified on-line and may require adjustment. If the process responds sluggishly to disturbances and/or change s to the set point, the controller gain is most likely too small and/or the reset time is too large. Conversely, if the process responds quickly and is oscillating to a degree that is undesirable, the controller gain is most likely too large and/or the reset time is too small. 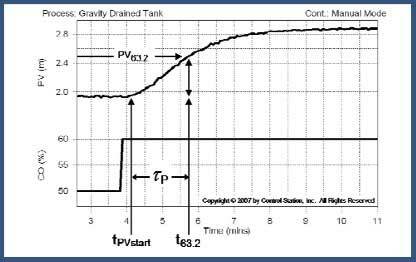 In Addition to the type of PID (PI versus PID) there are five (5) different controller calculation algorithms associated with the PID Block. "Proportional PV Derivative Type PID Control (I-PD)"
"PV Derivative Type PID Control (PI-D)"
The default algorithm is "Automatic Determination 2." The difference in the set point and disturbance rejection response of the different calculation routines are depicted below. 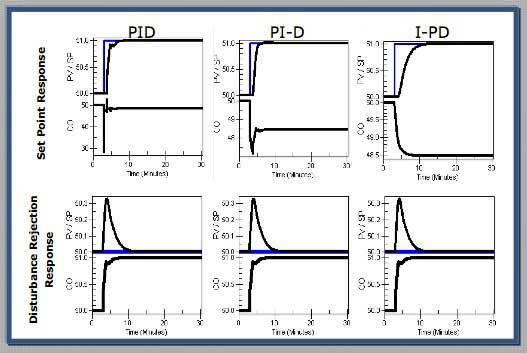 As you can see, the PID provides the harshest response to a set point Change while the I-PD provides the smoothest response. It should be noted that each of these responses was generated with identical tuning parameters. Even though the I-PD Response is the slowest, it has the same stability factor as the other algorithm types and will become unstable at the same point. Last year Control Station and Yokogawa Corporation of America announced the release of csTuner Powered by Control Station. 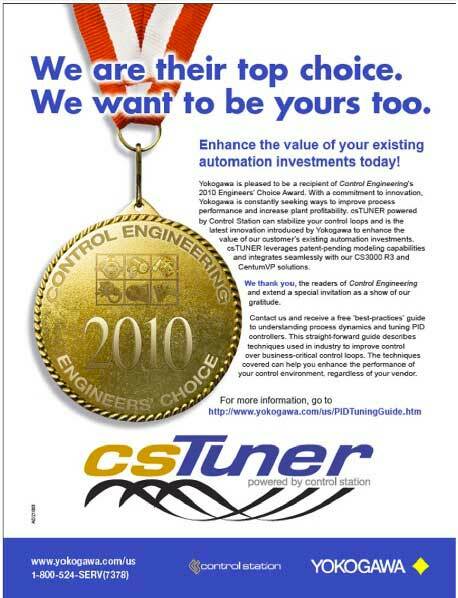 csTuner is award-winning technology that simplifies the optimization of PID controllers. It is an optional online PID diagnostic and optimization solution that integrates seamlessly with Yokogawa's CS3000 (R3) and newer DCS solutions. csTuner is configurable to support access to either real-time process data or process data that is stored in a data base (i.e. data historian). Analysis performed by csTuner can be used to better understand business-critical process dynamics and to improve overall production performance. Windowing in on segments of process data that are associated with any/all experiments perform ed (i.e. bump tests). Centering the process model over th e entire range of process data under review. The adjustable Closed-Loop Time Constant allows users to tailor a controller's performance. By choosing from among a wide range of possible settings, users can achieve control spanning from Aggressive to Conservative. Values for widely accepted performance statistics such as Settling Time, Percent Overshoot, Decay Ratio and Controller Output Travel. Advanced robustness analysis used in calculating process stability and maintaining safe operations. Side-by-side comparison of existing vs. proposed tuning parameters. Optional controller settings, including P-Only, PI, PID, and PID with Filter. Process data used and the associated model fit and simulated PID response graphics. Performance statistics and related stability analysis. Model parameters and both the related data properties and controller scaling values such as PV Min/Max and CO Min/Max. For more information about csTuner or other process automation and optimization solutions, contact Yokogawa Corporation of America at 1-800-524-7378 or via email at support@us.yokogawa.com.